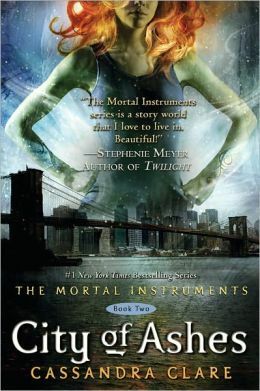 City of Ashes,the second book in Cassandra Clare’s Mortal Instruments series, is fast paced, filled with great action, and (my favorite bit) character development. (When I read this, I hear “character development” in a big booming announcer voice, you know the one I mean, right? Every. Single. Time.) As always, I promise not to spoil the surprises for you…no matter how hard it is. I swept through this book like a wildfire. There were no slow bits, no lagging parts, just good stuff. Clary, Jace and cohorts continue to gain depth, which just makes my little character-centric heart squeal with glee. City of Bones kicked off the series. (Yes, yes, I know the review of City of Bones just went up last week….I really do like these books that much.) City of Ashes is a great follow-up. While I felt City of Bones began a bit slow or rather flat (I still think it may have been purposeful); City of Ashes keeps you going at double time clear to the end. The relationships get more complicated and there is strain placed at the very heart of the characters. Their fault lines are being uncovered and bits and pieces are exposed and hammered. The cracks that were hinted at in the last book are assaulted here, and new weaknesses exposed. Will anyone be safe? Maybe I’m a bit evil, but I really hope no one gets a pass here. (Insert evil laugh here. Bwahahahaha!) Maybe, I’ve just been watching/reading things in which the writers are not nice to their characters, but the stories are just fantastic. The worse things are for them the harder I root for them. (Unlike my father, who likes the bad guys. He cheers and giggles when Ursula gets ginormous and looks like she’s going to win in The Little Mermaid. That just takes cheering for the underdog a bit too far…or maybe he just likes to stir up trouble…yeah, I’m betting on trouble too.) Seriously though, when bad things happen to good characters, as a reader/viewer/spectator, you get behind them. If there life just went merrily on, there would be no real reason to jump on the proverbial bandwagon, now would there? Confession, a scene or two made me a bit misty eyed. Unlike movies, books have always gotten to me. Characters can’t hide anything. In the real world, people can put up a front, keep the hurt inside and stopper up the tears to keep anyone else from seeing the damage. Characters don’t always get that option. You get to see every scar, all the turmoil, and each teardrop they refuse to let show, and it can break your heart a bit. As the characters here have whatever remains of their childhood innocence ripped away in various ways, they’re growing up, getting stronger, more vulnerable, and leaving behind the world they once knew. Kind of like coming of age while avoiding dying because a variety of creatures great and small are after you…because, you know, just growing up isn’t hard enough. Ms. Clare touches on some big issues here. Racism, for starters, and I like the way she went about it. In the first book you see some hints, but nothing really overt. In this one she calls it for what it is, and it becomes more of an issue. We see it through a different lens here, Shadowhunters, Mundanes, and Downworlders, vampires, werewolves, and faeries, instead of skin color, nationality or religion, but it works the same. The younger generation, follows the teachings of their elders. Then, through the eyes of an outsider who has no preconceived notions of how it is supposed to be, the walls begin to break down. It’s slow, painful, and incomplete. Just as in the real world, but it is still breaking down. I have a feeling that nothing in this world of Ms. Clare’s will be the same by the end of the series. I can’t wait to see where it goes. Hmm….yes, I do believe I can squeeze a trip to the bookstore in this evening. That next book City of Glass is calling my name. Used bookstore? The Frugal Bookworm is my favorite used bookstore here in Tulsa, but it is a bit of a drive. Especially, now with the ever-loving construction…well everywhere. Next up…City of Glass, Urban Shaman by C.E. Murphy, or Shadow of Night by Deborah Harkness? Not even I can tell you. The formidable glass-and-steel structure rose from its position on Front Street like a glittering needle threading the sky. Any good words about City of Glass, Urban Shaman or Shadow of Night to get me amped up about one of them? What is next on your to-read list? This entry was posted on Tuesday, July 30th, 2013 at 7:38 pm	and tagged with Book Reviews, Books, Cassandra Clare, City of Ashes, City of Bones, City of Glass, Mortal Instruments, Shadowhunter You can follow any responses to this entry through the RSS 2.0 feed.